Yesterday I ventured out in the sea with a small group of divers on the Giant Stride. Our destination…somewhere off the coast of Palos Verdes in about 2,000 feet of water. Why? Well… why not?! I took part in what is called a Blue Water Dive. This is where we drop a line around 100ft off the boat, then descend on it, tethering yourself to the down line. The tether line is typically around 20ft long, and you just float and drift in the middle of the ocean with the current. Unfortunately yesterday the current was a bit strong, and the ocean seemed pretty empty. Carolyn and I shared a down line, and we caught a glimpse of a Mola Mola swimming away from us as we descended but that was all we got. There were a couple floaters, pelagic life that just drifts around the sea. With the stronger current, I left the strobe to my camera on the boat, and just went down with my light for video. The experience was incredible. At first it seemed a bit daunting as I descended into nothingness. Once I hit my target depth, around 90ft I tried to clip my tether to the down line. After watching Carolyn (a BW veteran) easily clip and release her line, I started working on mine. Clinging to the down line for dear life, I was jerked up and down as the boat bounced on the swells way above us. I fumbled with my clips, and managed to get them unhooked from myself while keeping one leg wrapped around the down line. At one point my leg slipped and a quick vision of me floating tetherless as my friends drifted away flashed through my mind. I quickly kicked hard and grabbed the downline. Managing to secure my tether I cautiously started to let it out. 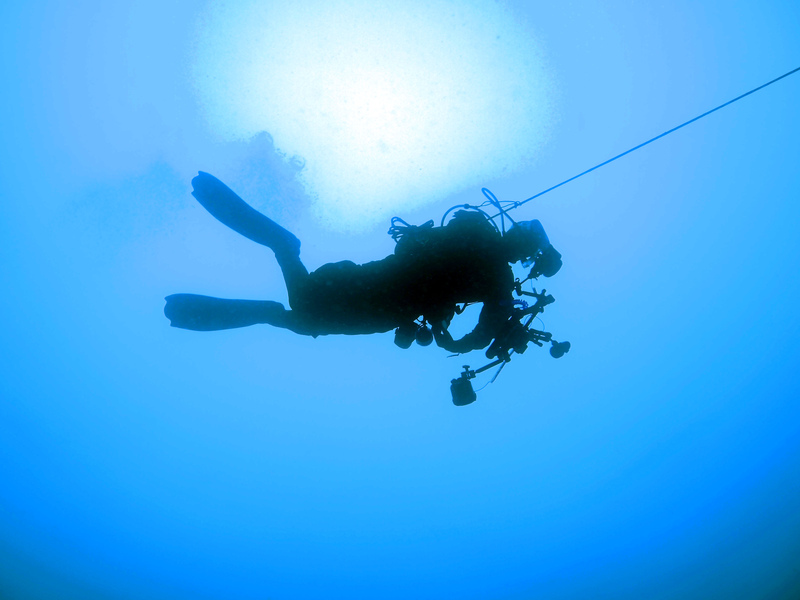 It was the weirdest feeling, being suspended in the water pulled only by the small line attached to my BCD. I didn’t need to navigate, I didn’t need to check on where my buddy might have wandered off to, I just hung there, scanning the blue void. I floated on my back staring up at the shadow of the boat 90ft above me, marveling that I could even see it and enjoying the weightlessness of the dive. I took a little bit of video so I could share what it was like, although there is really no way to express the giant expanse of water surrounding you on a dive like this through video. I’m definitely hooked on this style of diving, can’t wait to go again and looking forward to another twist if we manage to get our black water dive organized. Black water is the same as blue water….only at night. Sends a shiver down your spine, doesn’t it? Exciting. 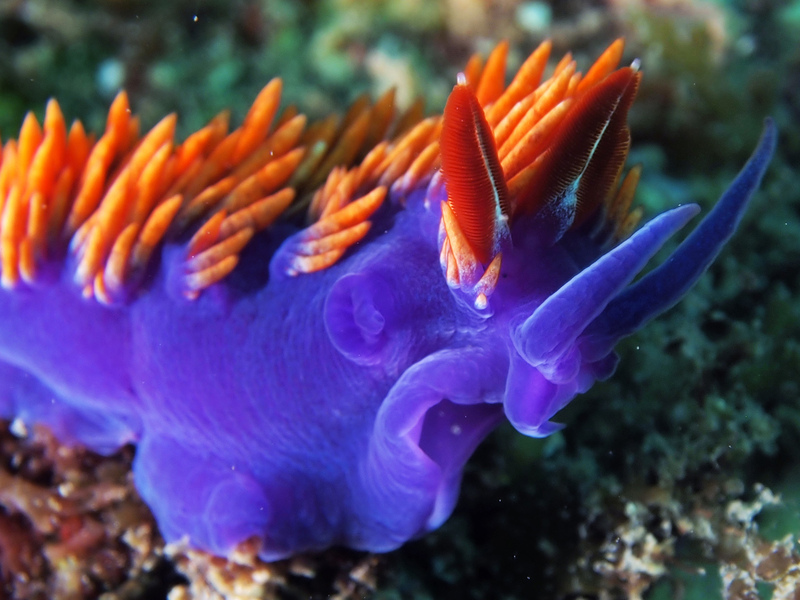 Diving in California, as I’ve learned over these past four years, can be completely unpredictable. Even if you pull up at a dive site that appears calm and clear on the surface, that is not necessarily what you will find on the bottom. 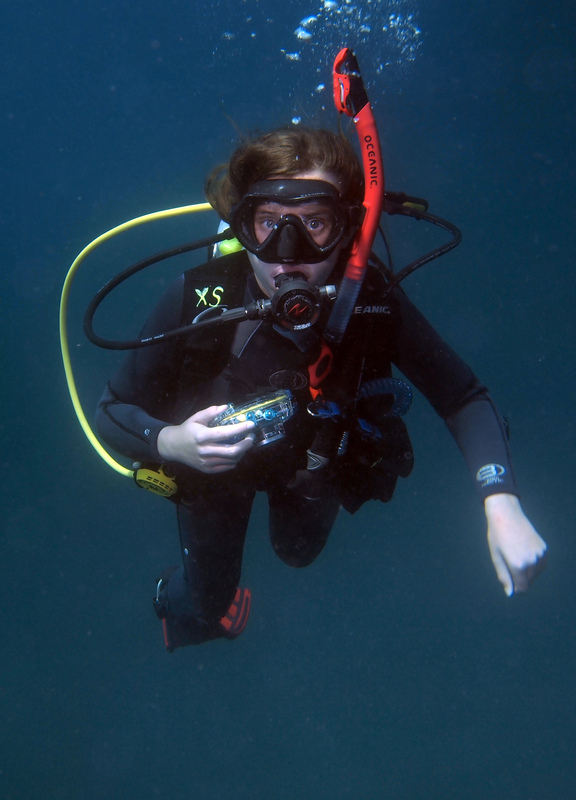 Last weekend I went out with a previous student of mine, a young girl of 12, for some guided dives on the Spectre. We were hoping for Anacapa Island, but strong currents and swell on one side and winds and chop on the other drove us over to San Clemente. We were still facing similar challenges there, but the larger island allowed a bit more refuge for us to anchor and and find a decent spot. The first place we pulled up to was Sandstone Point. Remember that site name, it says a lot about what we found on the bottom. The water was pretty calm up top, deep blue and looking down it appeared that we could see nearly to the bottom 30 feet below. Kelp was up, mostly, which was a good sign. Gearing up and dropping in I started to realize that the bottom was moving. The further we descended the weirder it got until we hit the soup. The bottom was moving because there was so much surge washing everything back and forth. Remember the dive site name? The bottom was completely sand and sandstone, with thick patches of kelp so as the surge pushed through, all the sand was kicked up creating a thick soup with visibility of about 5-10ft in places. The dive also had the feel of a desert sand storm. There was sand in the water, the surge was like the wind whipping around us and all the critters had disappeared. It felt oddly barren down there. 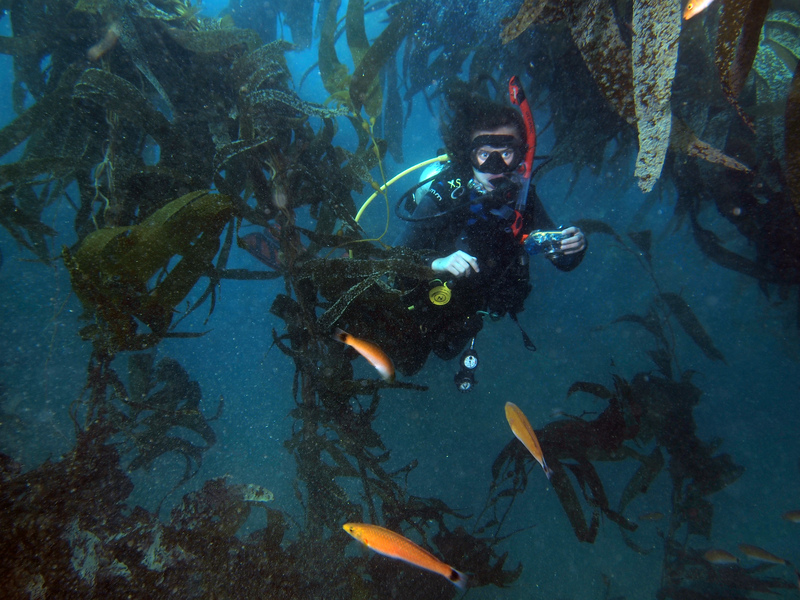 Despite the poor conditions, we still enjoyed the dive, exploring around as the different patches of kelp would slowly materialize in front of us. Isabel handled the soupy mess wonderfully, floating back and forth with the surge and still having a blast despite the conditions! 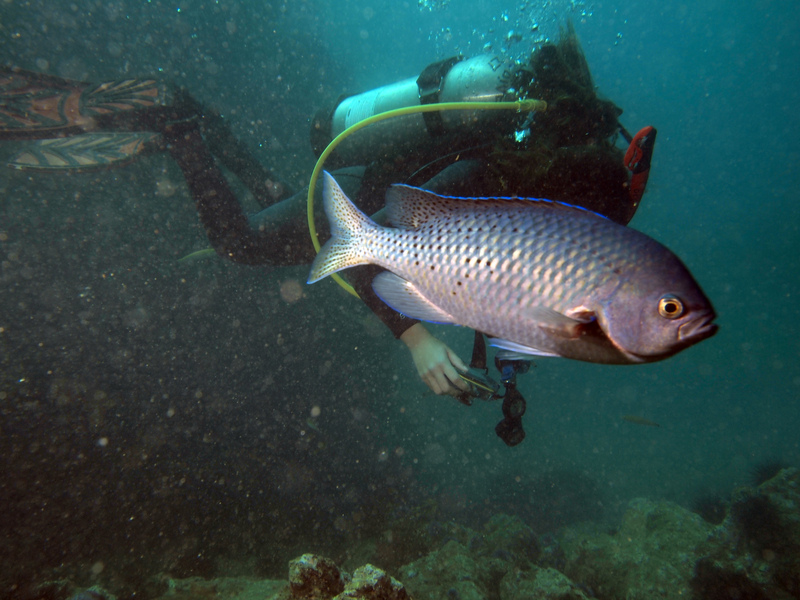 The next two dives offered rocky bottom, which dramatically improved the overall visibility. 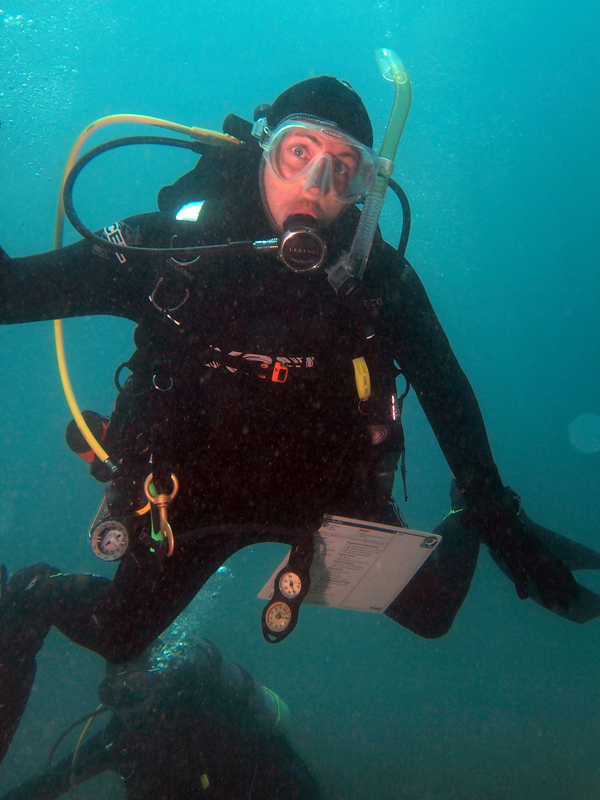 We hit Red Bluff first, and while there was still a bit of surge, it was a world of difference from the first dive. Wide open bottom with nearly zero kelp and large rocky boulders made this a great site for exploring and hunting down nudibranch and other good macro subjects. It would have been a perfect site for me to settle in a few key spots and really practice my photography, but I was leading the dive, not just out on my own. I did however put a plan into action to allow myself a chance to get a few photo practice moments. 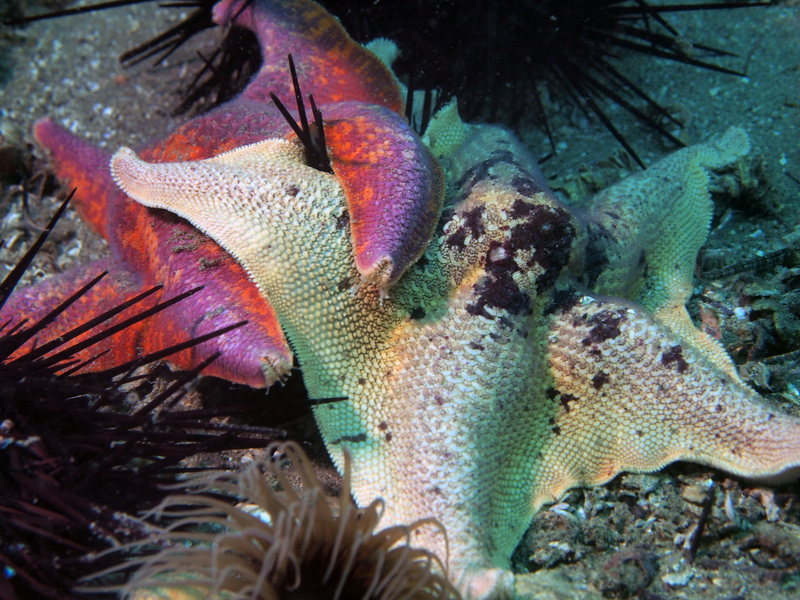 I brought my old little canon point and shoot for Isabel to use while diving. It gave her something to focus on, and just as I had hoped as soon as she started clicking away at the shutter she would pause on something which gave me small windows to find a subject and practice a bit before we’d move on. She had a blast with the camera, and watching her chase down fish and hang upside down trying to get a picture of a sea star reminded me of the first time I took a camera under the water. I also was reminded of how easily having that camera in hand makes a person forget about things like sticking close to a buddy. We had gone beach diving the day before with no cameras, and she was right next to me the entire time. Once she got that camera in hand though, there would be times I would look up, and she’d be further away chasing down a fish, or peering in a hole in a rock. After Red Bluff we hit up Dropoff Reef, which was great. There was a little bit of sand getting kicked up, but overall the water was clear and visibility was great. 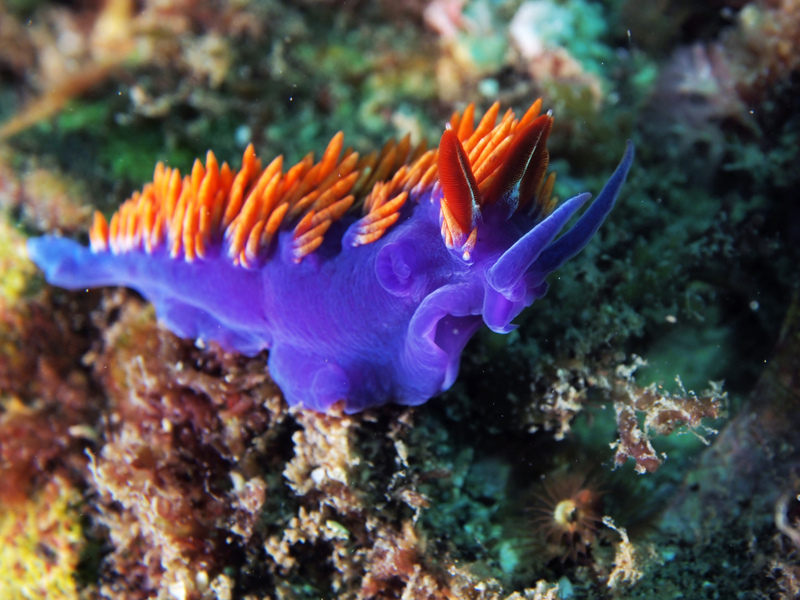 This site was littered with nudibranchs which made me wish I had brought my macro lens, but I enjoyed getting as close as I could with just my standard set up. The decent visibility also allowed me to practice some wide angle, though I’m still having trouble illuminating a diver coming over the reef… probably because they are too far away, or I need that second strobe to light them while my first is lighting the reef…. oh well. 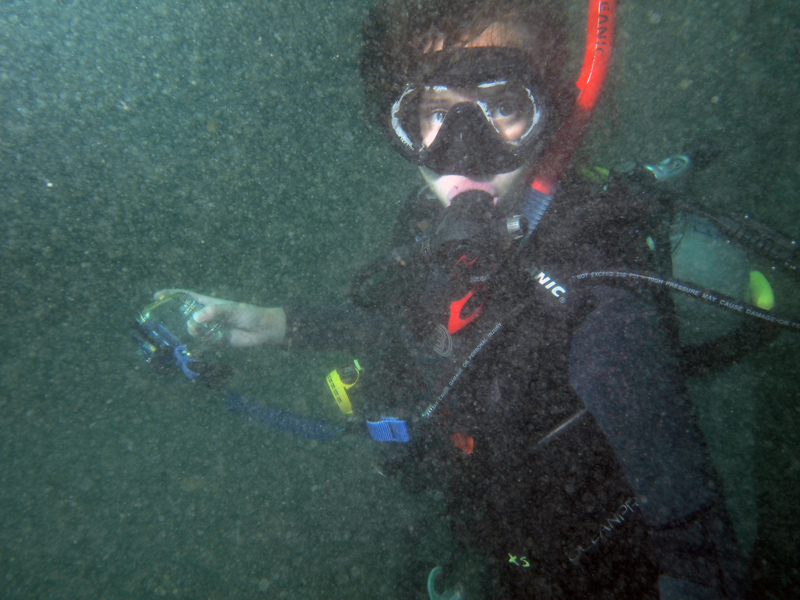 My little camera malfunctioned on this dive (it is getting old) and wouldn’t turn on for Isabel, but she enjoyed spending the time peering in and under all the rocky ledges as we swam out and back along the dropoff. I tried to keep moving on this dive so she wouldn’t be bored of sitting in one place and we got to see a nice big chunk of the reef. On our way back we ran into Matt and his two students as they swam around for the fun tour portion of the dive after finishing skills. Matt leads his students over to the reef, enjoying the nice visibility. Lastly we headed back to Sandstone Point. This time we ended up on the eastern side where the surge was still fairly strong, but the bottom was rockier which meant MUCH better visibility. Four dives in a day is tiring, and that fourth dip in the California waters is chilly even though the temperatures stay the same. We wandered around the kelp enjoying the better visibility, and watching the abundance of fish zoom around. It was no longer a deserted wasteland, but rather teeming with life. Lobsters came out from their rocky hidey holes and one group of divers happened upon a bat ray… unfortunately though it was not us. As Isabel’s tank drew lower we headed back to the boat, slowly ascending through the kelp for our safety stop, and watching the mass of divers (mostly students) that had collected on the bottom just below us. Then it was back on the surface and up on the boat for the last time of the day. With less surge on the far side of the same dive site, the visibility increased dramatically and all the fish came back! Overall it was a fantastic day of diving. You may have noticed from the pictures that young Isabel is truly a rockstar. She did all four dives with no gloves, no vest or hood! She claimed that she was not cold, though I did catch her start to shiver towards the end of the fourth dive. What I found great about leading her on the dives was the opportunity it gave me to practice shooting people, as I had her swimming right with me the whole time, a perfect photo subject.